Employee management is a tough job; from the little things, like getting new employees situated in the business and helping them find their way, to more complex tasks like managing and tracking the results of employees that are halfway across the world, human resources presents a lot of challenges – especially if you don’t have a dedicated HR team to handle it all for you. 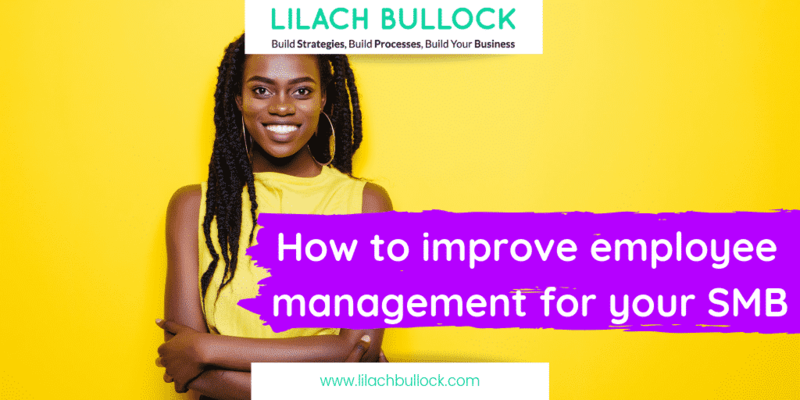 In this blog post, I’m going to show you how to improve employee management for your SMB. What does HR involve for small and medium businesses? There are several important aspects to human resources for SMBs and it all starts with onboarding new employees. This can be a lengthy process, especially if they work in a different part of the world. That’s because they need training, they need to understand what they need to do, how to use different technology, and they need to know what tasks they need to do and when. And who really has the time to do all that? Onboarding requires a lot of work and a lot of time if you don’t have a clear system put into place. This can actually mean different things. To start with, you need to keep an eye on their attendance; and this is especially difficult if you work with people from all over the world and even in completely different time-zones. And secondly, you also need to keep track of their performance and their results. You can’t be an effective leader if you have to take time every day to reach out to each employee to find out what they did and when; but at the same time, you also need to keep track of their work and their performance in order to help improve their productivity – and their results. You need to communicate this to your employees in a quick and efficient way, since they are likely to affect employees from all of your different departments, like marketing and sales. Ideally, you want to make all of these processes as easy as possible; not just to help the management team, but also the rest of your employees. This ensures better productivity across the board and that means better results for your business overall. Arguably the easiest way to handle all of your HR aspects is to use software to help. Zoho People is a human resource software for businesses of all sizes that pretty much manages all of your HR for you. This is great news particularly for small and medium businesses, as it means you don’t need a huge HR department to handle all of these – very important – aspects of your business. One of the main things I love about this tool is that it helps both the business and the employee; even if that employee is halfway across the world. As I mentioned earlier, employee onboarding can be an unnecessarily lengthy and complicated process; however…it’s also highly necessary. From welcoming your employees to your team to letting them know what their tasks are, there needs to be a close collaboration within the first few days of joining a new company. Plus, you can even encourage your employees to socialize to get to know each other and understand your company culture. 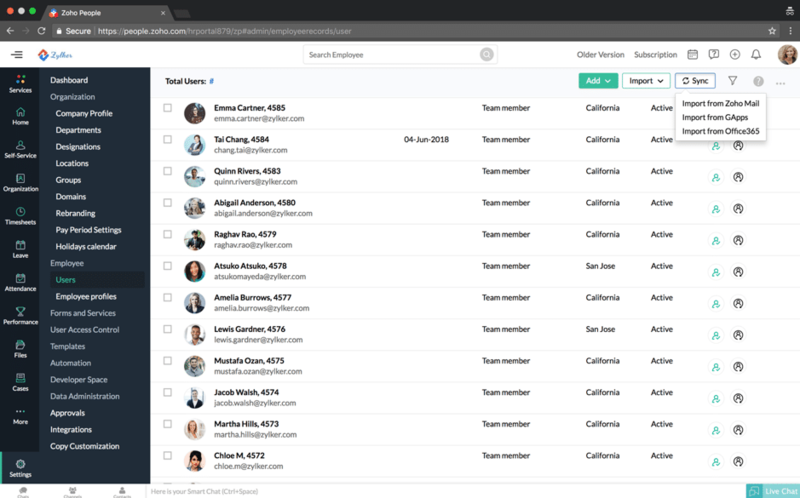 As I mentioned before, you can use Zoho People to create all kinds of different forms for your employees to complete; once they do, you can store all of this data automatically in an employee database so you can easily manage all of your employees from one place. Once you’ve done that, you can set it up so an email is triggered to the employee, immediately after you’ve finishing completing the form. 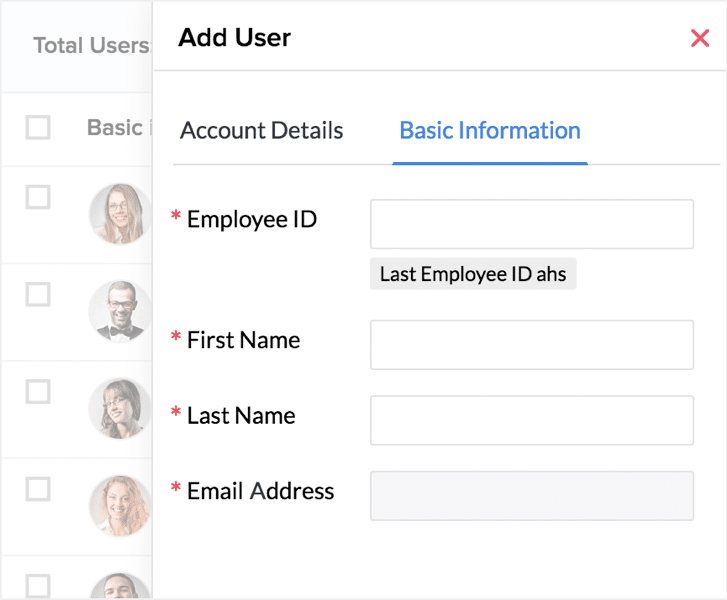 If you’re just starting out with Zoho People and need to log everyone in, you can import multiple users using all kinds of third-party apps like GApps. When you’ve entered your employees, you can search for anyone on your team with any information you have on them (like their department, their location, or their mobile number). It’s not just the managers that can leverage the software, but also the rest of your team. What this means is, your employees will be able to access their data from anywhere in the world in case they need to update or change something about their data. 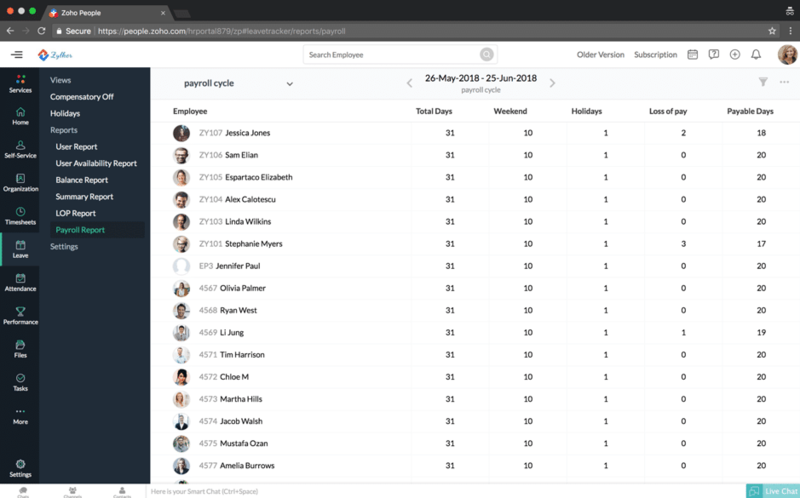 Employees can also use the system to check in and out and manage their time off, but more on that in a bit; plus, they can also access and check this data themselves through attendance and leave reports, as well as apply for leave, all in the same place. Your employees will receive a notification instantly, as soon as a new company announcement is posted on the platform. This also helps encourage your employees to collaborate – which is always a great thing. fostering collaboration helps companies grow and evolve; for example, your employees can share their ideas, ask for advice from their colleagues, or simply share something interesting. You need to be able to track your team’s time in order to improve productivity and decide where you should invest your resources. And that only grows in importance if you work with remote employees when you don’t have any (or little) face to face interaction. 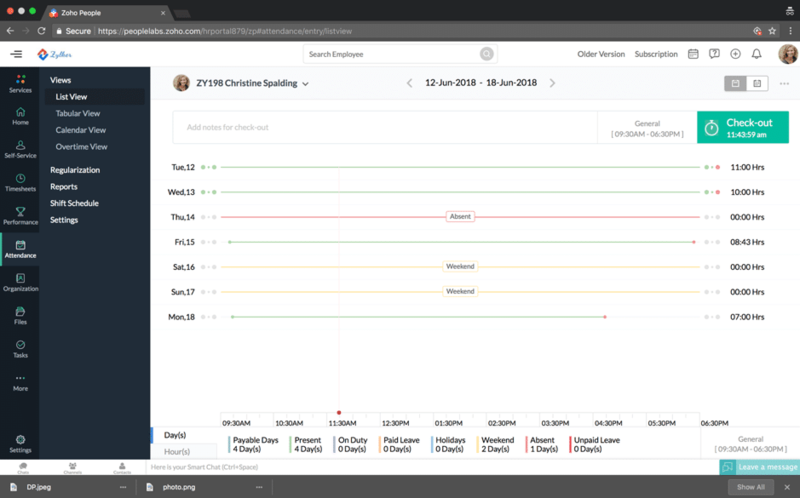 Your team can use the software to check in and check out every time they start/finish work, both via web and via mobile – whatever is easiest for them. 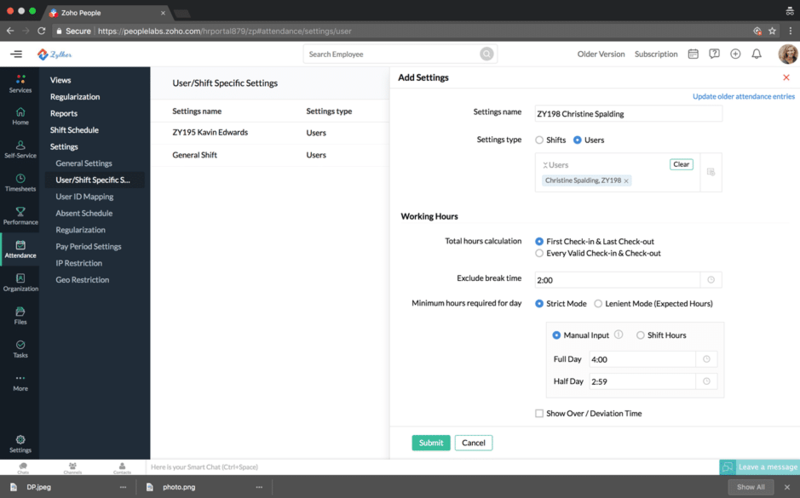 Plus, you can log in both billable and non-billable hours, so it also helps you keep your accounting and invoicing in check. The tool will then keep track of these records and generate reports to give you a clear picture of your team’s attendance. And, it can even geo-track these check-in’s and check-out’s so you can clearly identify locations. Zoho People takes a very interesting approach to team collaboration and especially, to feedback. 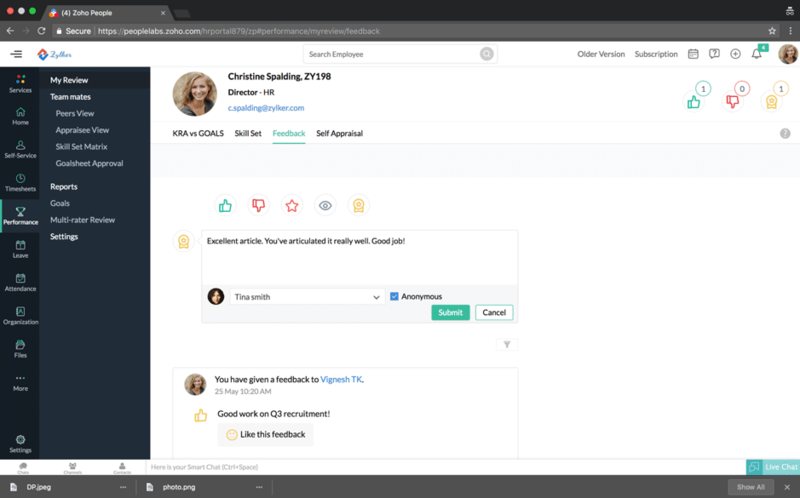 What I mean by that is that the platform not only encourages frequent feedback but encourages what is called “360-degree feedback”. 360-degree feedback basically means that you are encouraging your entire team to leave feedback on their employees’ work – something that is particularly useful for creative teams. For example, if someone from marketing created a new ad, the rest of the team can tell them their thoughts on this campaign, what they think could be improved, or give other ideas. Another way to boost your employees’ productivity is by setting goals; they’ll then know exactly what they need to do and what they need to achieve, which gives them focus. They can then also track their goals to see how they’re progressing. The management team too, benefits from these performance management tools, especially through detailed analytics. The tool really wouldn’t be complete without a mobile app – and, luckily, there is one, both for iOS and for Android devices. The app acts as a mobile employee directory so you can access information about your employees even if you are on the go. 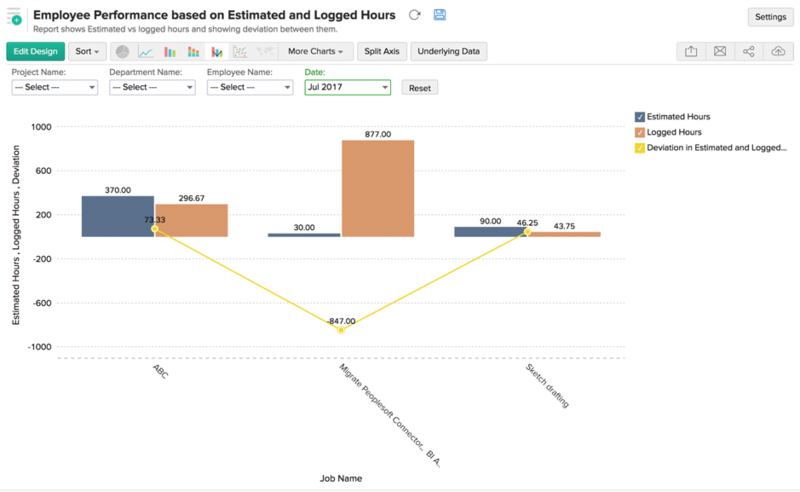 What’s more, your team can use the mobile app to check in or out and management can easily access this data (for example, see who just left the office, or check a specific employee). And since you are using a mobile device for this, you can also easily call, text, or email any of the employees in your directory. Whether we’re talking about a small business with a few employees or a large one that employs numerous people from all over the world, the Zoho People human resource software can make a huge difference to your productivity as a business. 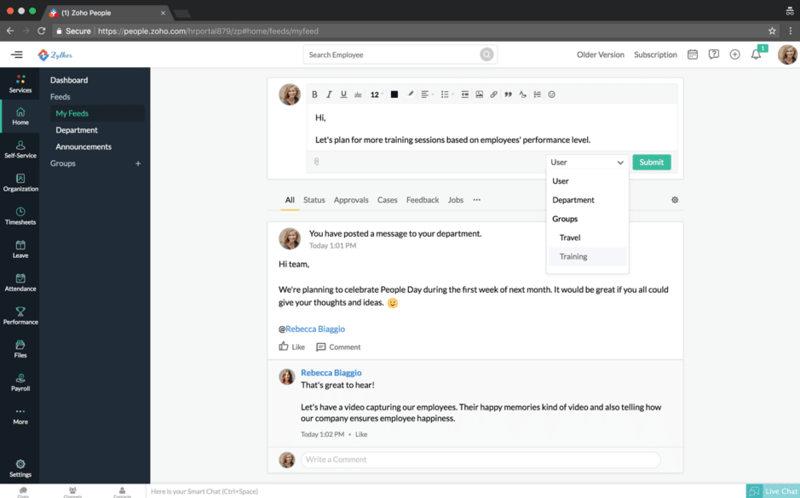 You get tools that save you time (such as quick, automated onboarding processes), but also tools that can help you better manage your team (such as access to your employees hours and the live feed for company announcements). How do you manage your employees, especially those in different locations? Great job! Thank you for putting such a great information about how to improve employee management. I can say here for my business management and of-course employee management I am using Fleep. Great tool ! Don’t need any kind of training to execute it, very simple to use.